For the Cultural Experience, I bought an ekiben, but not this one – this one looked like it had sweet eggs. Little did I know that the ekiben I purchased would also contain sweet eggs, cunningly hidden under the salmon. This is a foul betrayal by a fish which I have always trusted. 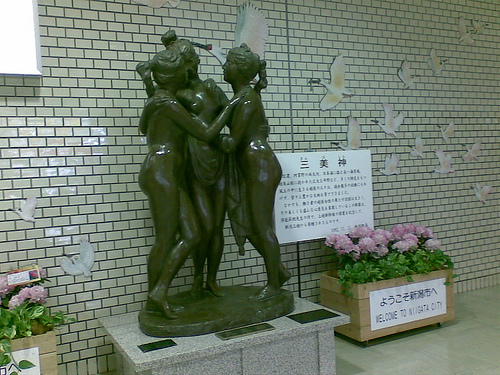 Naked ladies statue in the shinkansen area of the station. 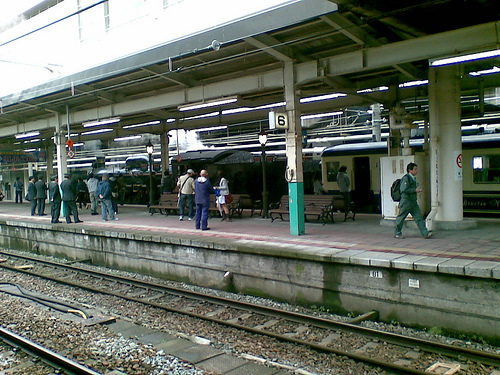 Niigata Station really likes its naked lady statues – there are more out front. 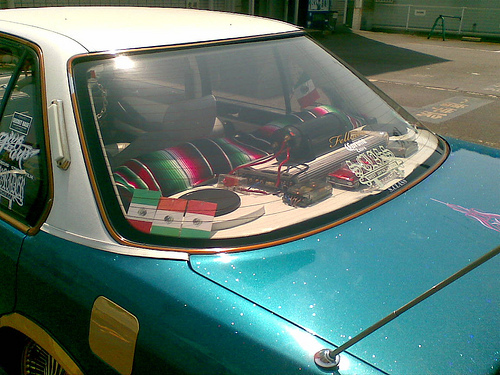 (I have no pictures of those, sorry.) Being lazy, I didn’t get out my dictionary to try to figure out what these naked ladies portend. For all I know, as foretold by a prophesy clearly printed on the wall, some elemental spirit arrived mere moments after my departure and breathed life into the statues, so that they might destroy the noodle stand that had so cruelly cursed them. 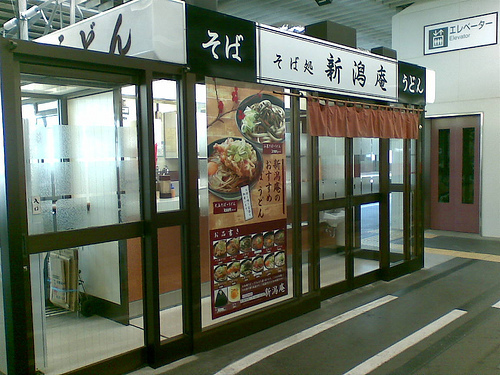 Noodle stand on the platform. 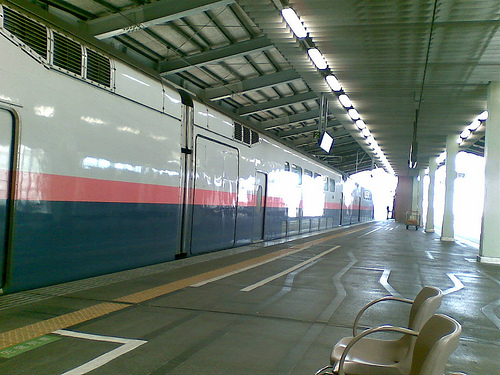 The shinkansen. I’ve now ridden on it three times, but I still think it’s cool. 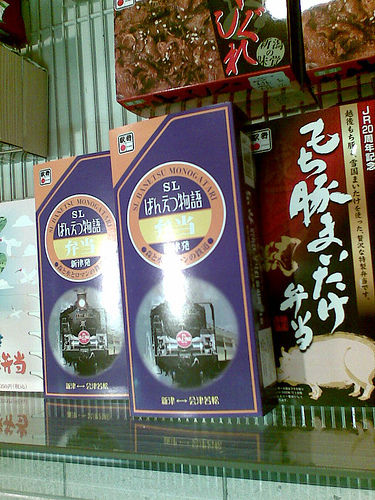 An advertisement on the shinkansen for Yoshinogawa Sake. It claims that 「酒は人をサムライにする」 – “sake turns a person into a samurai!” I hope that’s sake-as-in-sake and not sake-as-in-alcohol; I don’t want to throw out my Baileys. What can I say, sake! I guess I’m just not big on systems of government based on inherited class privilege. Or shaving my head. Its presence on Yahoo Answers suggests that some Japanese people find this ad’s premise as worrying as I do. 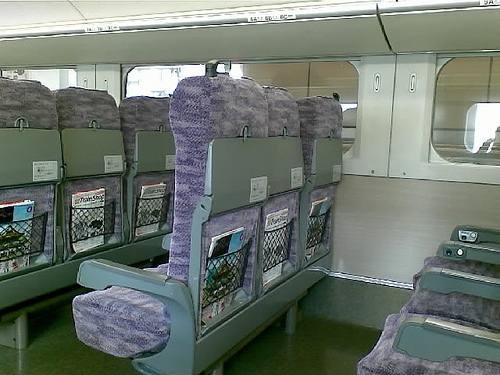 The inside of the shinkansen. Please enjoy the cheerily ugly purple print on the seats. 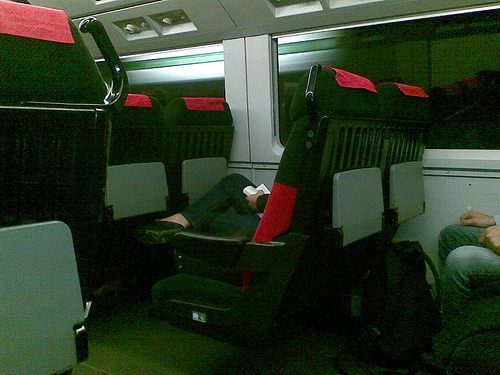 The Narita Express interior is done in the classic “Death Star” style. 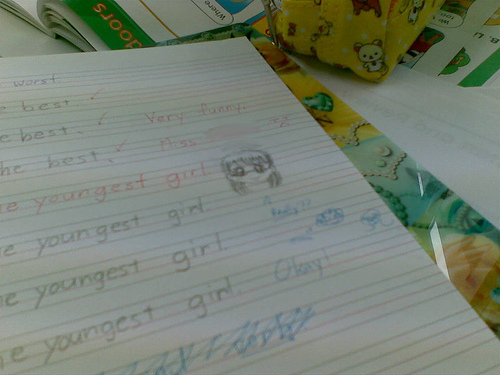 And in conclusion, my blurry photo of Mee’s massively shoujo-fied drawing of herself. She doesn’t like the way I draw her at all.